A. Home-buyers who wish to purchase a new build property when they cannot otherwise afford one in their area because they have an insufficient combination of the income and deposit needed to secure the level of mortgage required. These include first-time buyers who are trying to get onto the property ladder, and ‘second-movers’, needing to move up the ladder to a bigger home. These loans are not available for Buy-to-Let landlords or second home owners. Q. Who is eligible – and for what types of property? A. You will need to put down a deposit of at least 5% of the property price. The Government will give you an equity loan for up to 20%, interest-free, for the first five years, and you will need a mortgage of 75% to cover the rest. As a result of providing you with this assistance, the Government is entitled to its money back, plus a share in the future sale proceeds equal to the percentage contribution it made to assist your purchase. This type of loan is known as a ‘shared equity’ mortgage. 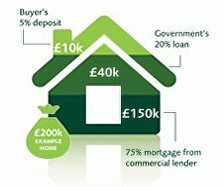 If the home in the graphic above sold for £250,000, making a £50,000 ‘profit’, you’d get £200,000 (£150,000 from your mortgage, £10,000 cash deposit back and £40,000 as 80% share of the ‘profit’) and pay back £50,000 to the government (the £40,000 equity loan, plus an extra £10,000 as 20% share of the ‘profit’). You’d need to pay off your mortgage with your share of the money. Q. When will I have to pay back the equity loan? The home will be in your name, which means you can sell it at any time. However, you will have to pay back the equity loan when you sell your home or at the end of your mortgage term – whichever comes first. You can also pay back the equity loan without selling your home. Q. Are there any fees for the equity loan? You will not be charged loan fees for the first five years of owning your home, but, in the 6th year, you will be charged a fee of 1.75% of the loan’s value. After this, the fee will increase every year in line with inflation. The annual increase in the fees is worked out by using the Retail Prices Index (RPI) plus 1%. For instance, if the RPI is 5% at the end of Year 6 of your Equity Loan, the fee will increase by 6% from 1.75% in Year 6 to 1.86% in Year 7 (which is 1.75% + (1.75% x 6%) = 1.86%). Your mortgage adviser can provide you with a more detailed illustration when they help you with finding the right mortgage. 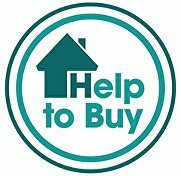 A Government-appointed Help to Buy agent will contact you before the fees start, to set up monthly payments with your bank. You will also be sent a statement about your equity loan each year. Q. 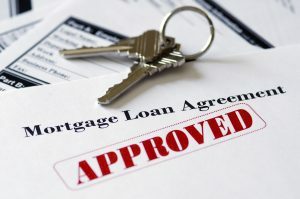 What are the interest rates on the mortgage loan? Lenders offer more competitive rates to borrowers with bigger deposits as they carry less risk. This scheme means that they are only lending 75% of the property value rather than 95% which means you will benefit from cheaper rates of interest than you usually would.